Founded in 2004, this family winery and its vineyards are located on the south slopes of the Grand Hill (Veliko Brdo) west of the lovely town of Demir Kapija close to the highway E-75. The winery is named after the famous Popova Kula (Priest’s Tower) that once served as an important checkpoint on the old Roman road that passed next to Demir Kapija. The original tower has since been destroyed but the winery has built a new 17 meter high tower in its honor. Popova Kula has pioneered a method to extract the essential qualities of the indigenous varietal Stanushina. Due to popularity of international varietals, the cultivation of Stanushina experienced a major downturn in Macedonia and the winery has made it their mission not only to preserve this grape that is found only in the Tikveš region but to also showcase its wonderful qualities. From these efforts they have produced a Stanushina Red and a Stanushina Rosé. The Stanushina Red is refreshing with its balanced sweetness, fragrant wild strawberries and is a soft spice and easy red to enjoy. Demir Kapija Line of wines consists of the Altan, Kalesh, and Rumeno labels. Altan is a white wine cuvee that is 70% Sauvignon Blanc, 25% Chardonnay, and 5% Muscat Ottonel. Kalesh is a red wine cuvee made up of 65% Vranec, 20% Cabernet Sauvignon, and 15% Merlot. Rumeno is an enterprising wine crafted from Muscat Hamburg grapes. 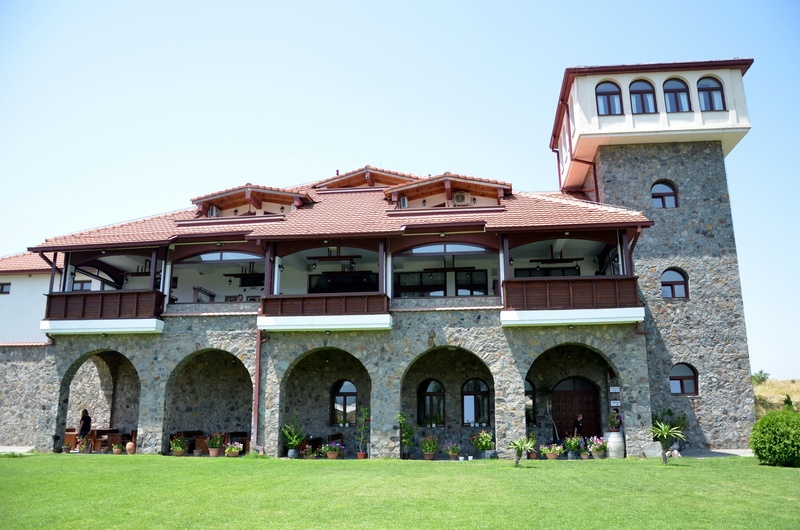 Their Classic Lines features white wines such as Chardonnay, Chardonnay Barrique, Muscat Ottonel, Sauvignon Blanc, Temjanika, and Zilavka plus they offer two semi-sweet wines made from Chardonnay and Temjanika. The red wine varietals of the Classic Line are Cabernet Sauvignon, Merlot, Prokupec, and Vranec. The Muscat Ottonel, a very refreshing wine offers a burst of peaches, the Zhilavka is a great semi-dry summer wine with elegant herbal and soft pear tones and the Prokupec, normally found in Serbia and Montenegro offers black currant, blackberry and black cherry aromas and flavors. Their premium wines consist of Cabernet Sauvignon Reserve, Vranec Reserve, Cabernet Sauvignon Perfect Choice and Vranec Perfect Choice. The Vranec Perfect Choice is aged for two years in wood and aged for another year in the bottle. This wine is deep dark ruby red in color, has vivid wild blueberry and wild cherry aromas, is full bodied and dry, very hearty and offers a palate full of forest fruit flavors with a lengthy exit. The winery has a great location with its close vicinity to Highway E-75, easy on and easy off, making it very convenient for travelers to drop in, enjoy a meal at the restaurant and taste the wines.